CHERRY HILL, N.J. - Jan. 12, 2017 - PRLog -- The Inside Baseball Coaches Clinic January 12 thru 14, 2017 will feature an elite group of platinum sponsors including Flightscope, Turface, Fan Cloth, Rapsodo Baseball, Blast Motion and Rukket, all showcasing the latest products in the baseball industry. This hands-on expo will accompany the main event of powerful and insightful presentations from 15 of the nation's top-rated baseball coaches from Hofstra, Louisville, PENN State, Virginia Tech, Michigan State, Kansas State and many more. Industry experts from Baseball America have called our coaches "some of the brightest minds in the game today." We are featuring 15 renowned coaches, presenting over 60 powerful and insightful talks covering topics including in-game coaching, pitching, hitting, fielding, speed, arm care, functional strength, mental edge, and much more. The 3 day event is conveniently held at the Crowne Plaza at 2349 West Marlton Pike in Cherry Hill, New Jersey. Registration is now open to high school coaches, assistant coaches, baseball players, as well as students under age 18. § FlightScope brings the first of its kind in multi-frequency 3D tracking radar for baseball and softball, employing direct distance measurement to provide accurate positions, speeds, and angles of pitched and hit ball trajectories. § Turface Athletics is referred to as the best distributors in the business, providing field maintenance solutions resulting in safer, playable fields. Turface products has 50 years of expertise in delivering the highest quality infield and turf conditions, hands-on education and ongoing industry support. § Fan Cloth offers a one-of-a kind fundraiser which engages students in the process of raising funds for your organization. Fan Cloth provides innovative design to generate bigger profits back to your program through the use of a catalog campaign featuring name brand apparel of the most popular items on the market and personalized designs. § Rapsodo uses real data measure the impact of spin on every baseball. Rapsodo syncs wirelessly to Ipad or PC to review comprehensive analysis of 8 different realtime pitch metrics as well as the ability to track progress over time. § Blast Motion is named the official bat sensor technology of the MLB. Blast Baseball 360 features Apple Watch app, HealthKit and SiriKit support to help athletes and coaches gain a new form of real-time "wearable" swing analysis and training feedback while allowing players and coaches to use integrated communication, analysis and management tools to improve their game. § Rukket Sports is a USA owned and operated business providing products for a variety of sports including baseball practice nets, hitting and training balls, strike zones, rebounders and portable items. Rukket Sports products are designed with input from college level athletes and coaches. Learn firsthand about new products and brands on the market today! 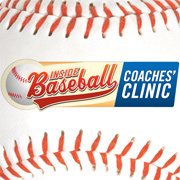 Register for the 2017 Inside Baseball Coaches Clinic by visiting www.insidebaseballcoachesclinic.com (http://www.insidebaseballcoachesclinic.com) today!